MATANO, HILDA L., 90, of Coventry, past peacefully at home Wednesday (6/27/2018), Born In Cranston a daughter of the late John and Rose (Perry) Petraca. She was the wife of the late Alfred E. Matano. Mrs. Matano worked as an assembler for General Electric for 20 years before retiring in 1995. 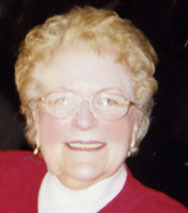 She leaves 2 daughters, Susan P. DeLorenzo and Joanne M. Spaziano both of Coventry, a son Robert E. Matano of Warwick, 7 grandchildren and 4 Great Grandchildren. She was mother of the late Kenneth A. Matano. Her life will be celebrated with calling hours Saturday from 8:00am to 9:30am in the Stapleton Family Funeral Home, 684 Park Avenue, Cranston. Mass of Christian Burial Saturday at 10:00am in St Matthew Church, Elmwood Ave. Burial will be in St Ann Cemetery, Cranston.